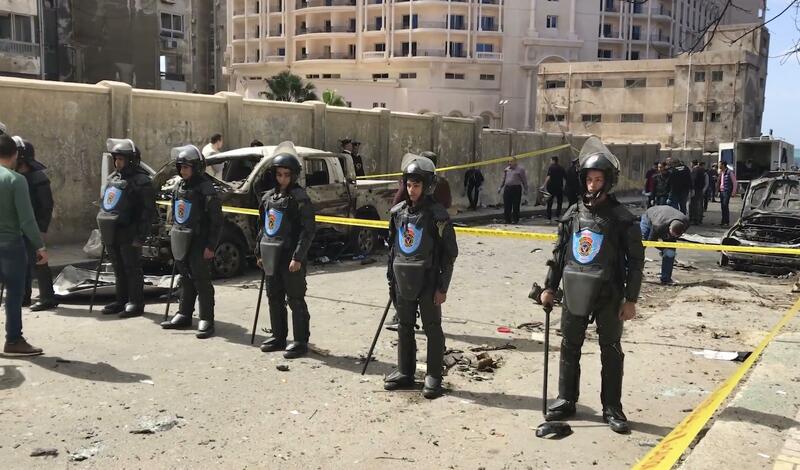 CAIRO – A bomb placed under a nearby car exploded Saturday in the coastal city of Alexandria as the city security chief’s convoy passed by, killing two policemen and wounding four others, the Interior Ministry said. The Interior Ministry had earlier reported only one policeman killed in the blast which occurred in the vicinity of a police station in the city’s central Roshdi district. Health Ministry spokesman Khaled Megahed told the Associated Press that two policemen were killed and four others wounded in today’s explosion, adding that one civilian was also wounded. The attack comes just days ahead of Egypt’s presidential election, in which President Abdel-Fattah el-Sissi is virtually certain to be re-elected. It also comes during a massive security operation involving land, sea and air forces in areas covering north and central Sinai and parts of Egypt’s Nile Delta and the Western Desert, along the porous border with Libya. Published: March 24, 2018, 1:36 p.m. Updated: March 24, 2018, 1:36 p.m.